There have been many memorable Wimbledon finals over the years – but which deserves to be crowned the greatest of all time? If this debate was decided on atmosphere, then the 2001 men’s final would prevail in straight sets. It saw Croatian Goran Ivanisevic become Wimbledon’s first wildcard winner, defeating Aussie Pat Rafter 6-3, 3-6, 6-3, 2-6, 9-7 on People’s Monday to conclude a rain-soaked tournament. The non-exclusive final meant centre court was full of passionate Croatians, the self-proclaimed Aussie “fanatics” and many British neutrals hoping for a close encounter. This all made for a rapturous atmosphere never seen before at SW19, as strawberries and cream were traded in for inflatable kangaroos. The match itself had everything. Explosive groundstrokes, delicate volleys and even a McEnroe-esque outburst from big Goran. The Croat slammed his racquet down in disgust during the fourth set, as Rafter broke serve, before going on to send the match into a decider. As the raucous fans exchanged chants, the two exchanged holds of serve until the 15th game. Rafter was the first to sink, his tame serves punished by Ivanisevic. Three Championship points later, King Goran finally saw off the resilient Aussie to rewrite his label at the time of “the most talented player never to win Wimbledon”. 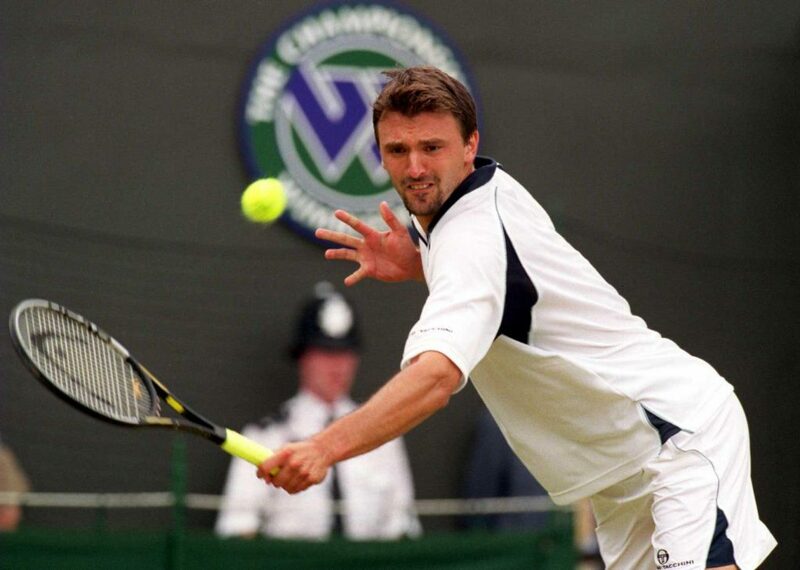 Ivanisevic was a whopping 150/1 in the lead up to Wimbledon. Although an outsider triumph is rare these days, tennis fans can try to predict the next Goran by betting on any player outside of the so-called “top four”. The 2001 classic came to be after the number one seed and all-time great Pete Sampras crashed out in the fourth round, at the hands of a certain Swiss prodigy. Roger Federer still regards this match as his career favourite, and it was the first and last meeting between the two, as the baton was placed in Roger’s deft touch. Federer vs Nadal: the greatest match in tennis history? Both Federer and hard-hitting Spaniard Rafael Nadal have since eclipsed Pete Sampras’ record of 14 Grand Slam trophies, now holding 19 and 16 respectively. Hence it’s no surprise that when these masters of their trade meet on the court, it results in sheer artwork. A notable mention must go to their 2007 Wimbledon final when Federer defeated Nadal 7-6, 4-6, 7-6, 2-6, 6-2. But the following year we witnessed arguably the greatest match in the history of tennis. 30,000kg of strawberries, 10,000 litres of cream and 54,000 Slazenger tennis balls later, the stage was set. After winning 14 of the last 16 Grand Slams between them, this was Nadal’s third consecutive attempt at dethroning Federer for the big one. It was a four-hour, 48-minute display of breathtaking grass court tennis, as neutrals around the world became tennis fanatics. The Majorcan found himself two sets up before the genius of Federer saved two Championship points to send the game into a decider. The final set was a testament to Nadal as one of the all-time best. Rafael Nadal and Roger Federer during the 2008 Wimbledon Men’s Final. At 7-7, Federer held off three break points but he was wilting. Nadal relentlessly forced an error to break serve. The Spaniard then held serve as well as his nerve. 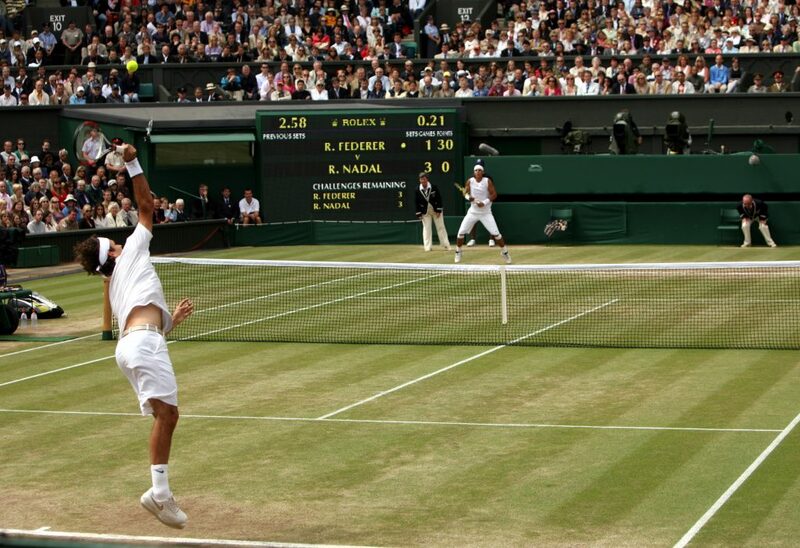 A thunderous backhand from which Federer could only net saw him seal the win. He collapsed into the ground as the new champion, prevailing 6-4, 6-4, 6-7, 6-7, 9-7. As Rafa took fate into his own hands at Wimbledon 2008, the punter can now make use of #YourOdds to request their own odds on personalised tennis markets. “You cannot be serious”, we hear you say and the 1980 epic between Bjorn Borg and John McEnroe will always be considered equal by many. But in the modern era, we will be lucky to witness a final worthy of stringing the 2008 thriller’s racquet.